Mahiedine Mekhissi-Benabbad: Meet the mascot-hating Frenchman who won’t stop fighting people (and mascots). Mahiedine Mekhissi-Benabbad celebrates his win in the 3000-meter steeplechase at the 2012 European Athletics Championships. Known for: Steeplechasing, mascot-abusing, slap-fighting. Why he might be a jerk: At the 2012 European Athletic Championships this July, Mekhissi-Benabbad celebrated his victory in the 3,000-meter steeplechase by assaulting a 14-year-old girl wearing a mascot costume. As you can see below, the mascot, “Appy”—which looks like either a tooth or a double-wide roll of toilet paper—was approaching the Frenchman with a gift. Mekhissi-Benabbad swatted the gift to the ground and shoved Appy with both hands. Two years earlier, at the same event, Mekhissi-Benabbad asked a different mascot—a moon-faced humanoid named Barni—to kneel and then shoved it to the ground. Watch your back, Randall Simon—this French guy is taking mascot assault to new heights. 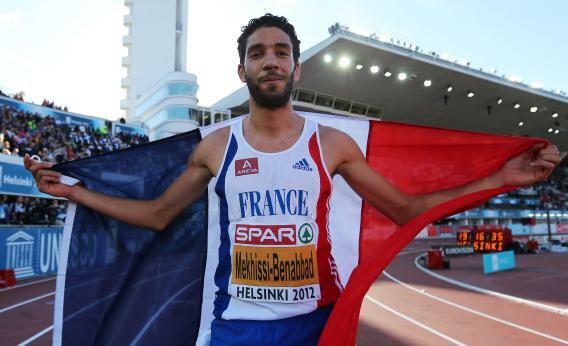 When he’s not terrorizing mascots, Mekhissi-Benabbad is fighting other runners. After a 2011 race, he came to blows with countryman Mehdi Baala. Why he might not be a jerk: From that last video, it looks like Baala started the fight by head-butting Mekhissi-Benabbad. Maybe Baala really loves mascots—who knows. It’s also possible the 2010 mascot incident could have been a joke that got misconstrued. Both Mekhissi-Benabbad and the huggable humanoid seem happy at the beginning of the clip, though the mascot’s smile is admittedly painted on. Also, it turns out that the googly eyed Appy is neither a tooth nor a roll of toilet paper. Appy is in fact an anthropomorphic smartphone app, which is an incredibly annoying concept. I, too, would push Appy to the ground if given the opportunity. Jerk score: I’ll give Mekhissi-Benabbad 2.5 out of 3 points for style, because smacking Appy’s proffered gift was a nice, churlish touch. I’ll give him 1 out of 3 for technical merit, because, come on, an Olympic athlete should be strong enough to push a 14-year-old girl all the way to the ground. I’ll give him 3 out of 3 for consistency. (When you’ve got a jerk move that works, keep using it, brother!) And he gets 1 out of 1 points in the “have you ever pushed more than one mascot to the ground” category. 7.5 out of 10 for Mekhissi-Benabbad. The Olympics haven’t even started, and we might have already found our winner.